Let’s run through the process of setting up an installation of FeedWordPress to syndicate content from one or more external feeds into your WordPress blog. To start out, here’s our sad, empty blog, with hardly any content in it. … where we can activate the plugin. 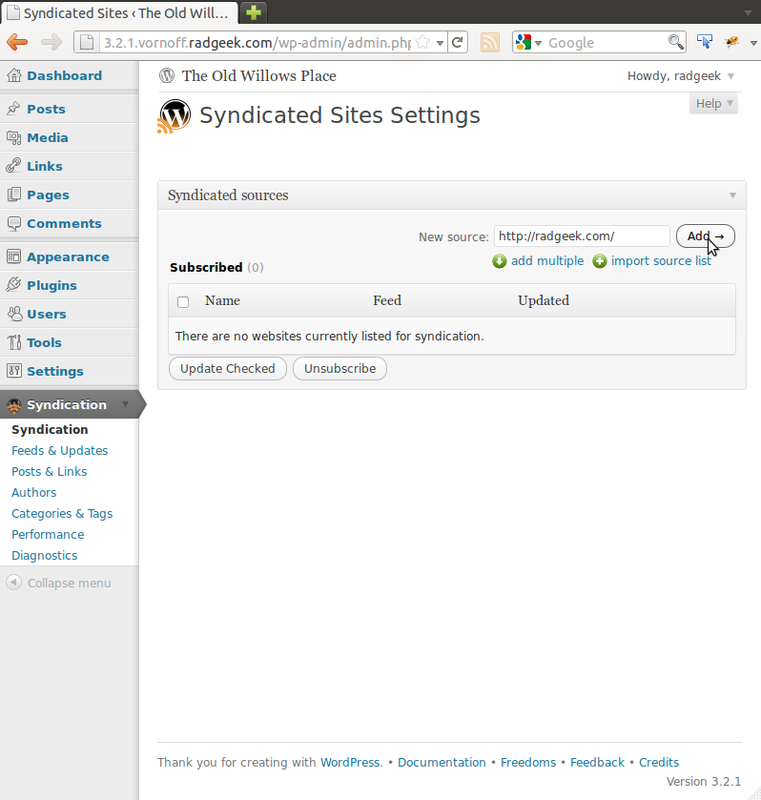 Once you activate it, FeedWordPress will add a new Syndication group to your menu bar. You can now proceed on to the Syndication page to start setting up the sources that you’d like to syndicate. Here’s our Syndication page. If you’re just installing FeedWordPress for the first time, chances are you won’t have any contributing sources set up just yet. So let’s add one through the Add new source box. The URL you enter here can either be the URL of the website you want to syndicate, or a URL that points directly to the feed that you want to add. If you give it the URL of a human-readable website, FeedWordPress’s Feed Finder will query the website to try to find out the URL for the feed associated with it. 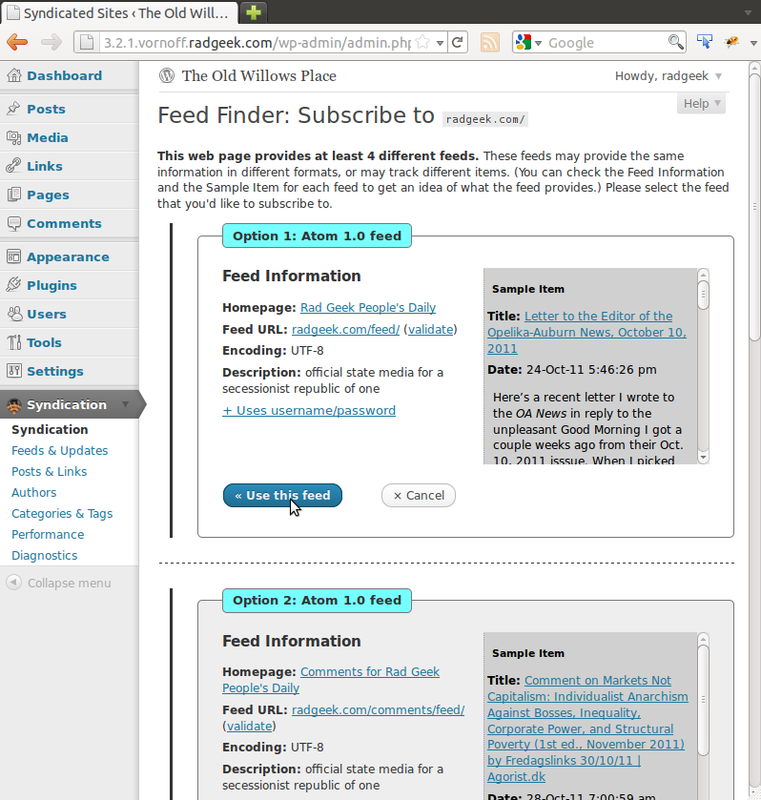 If FeedWordPress finds one or more feeds, it will come back with a list of possible feeds and samples of the content on them. After you’ve added your first contributing source, you may want to add more using the same procedure. I’ll wait while you finish …. … O.K. Once you’ve got all the feeds added that you want to add, you may want to check some of FeedWordPress’s settings for syndicated content to make sure that incoming syndicated content is handled the way you want it handled. You probably want to do this before you import your first posts from the feeds, so that everything will be handled properly from the get-go. 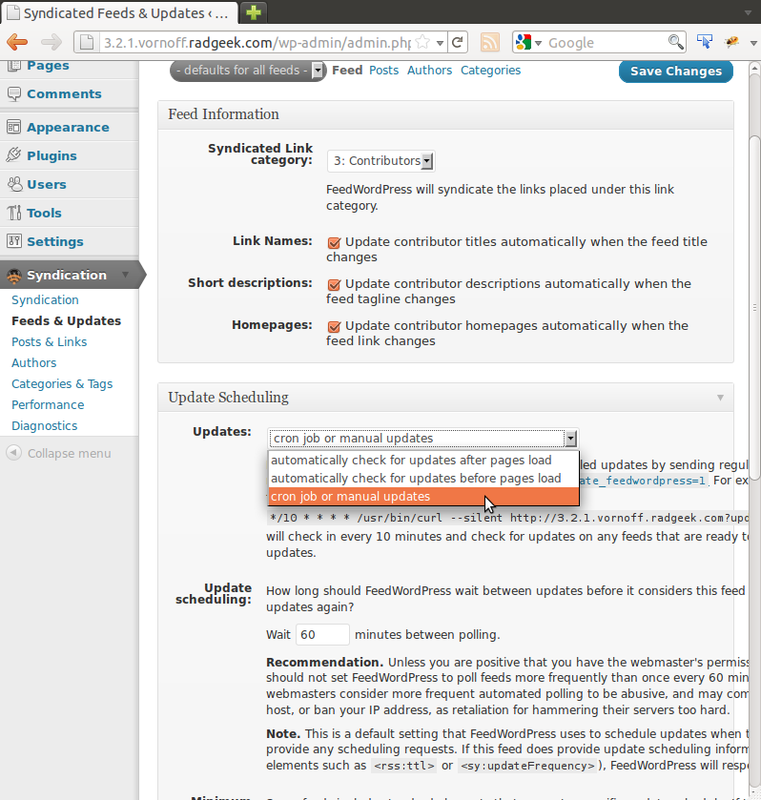 You can configure most of the settings for all feeds, or on a feed-by-feed basis. For a breakdown on all the different ways you can have FeedWordPress handle incoming posts, see the Configuration How-To. Once you’re done setting things up for posts to be handled the way you want them handled, it’s time to go to Syndication –> Feeds & Updates to choose the method you want to use for Scheduling Updates. If it is possible in your web hosting environment, you may want to schedule updates using a cron job, in which case you should choose cron job or manual updates here. If you cannot set up a cron job, or just want to get started as quickly as possible, choose one of the two automatically check for updates… options, which will make FeedWordPress check for updates on a schedule linked to users viewing pages on your blog. When you’re first starting out, pageview based automatic updates will work tolerably well for most people most of the time. But if you intend to create a large aggregator, with many feeds (for a ballpark, let’s say more than about 10-20 sources), you will probably want to look into getting a cron job set up. If you want to manage imports and updates manually — so that FeedWordPress only checks for new posts when you press a button telling it to do so — choose cron job or manual updates. If you’re really unsure about what to do, choose automatically check for updates after pages load for a start, and then come back to read through Scheduling Updates for all the details. One thing you might notice (ought to notice) as you scroll through the newly-syndicated content is that the default WordPress themes don’t know anything about where your syndicated posts came from, and so don’t display any information indicating the original source of the post. The permalinks (in the post title and so on) will point back to the original source if a user happens to click on them, but in a theme like Kubrick, these posts will visually appear just like any other post that you put up on your blog. Once you have the attribution boilerplate all set up, you should now have syndicated content automatically appearing on your blog, with each syndicated post being attributed to its original source. More how-tos, tutorials, and guided tours will be made available soon. Hi I tried the plugin 3.1.3. It works with NO issues. Any work around or solution please. Im new to this so you may need to bear with me. Im using feedwordpress and im having one problem. Basically i want to automatically grab images from posts and set them as featured. I am using a video template from Templatic. Any help would be V helpful. Did you find a way to fix this? 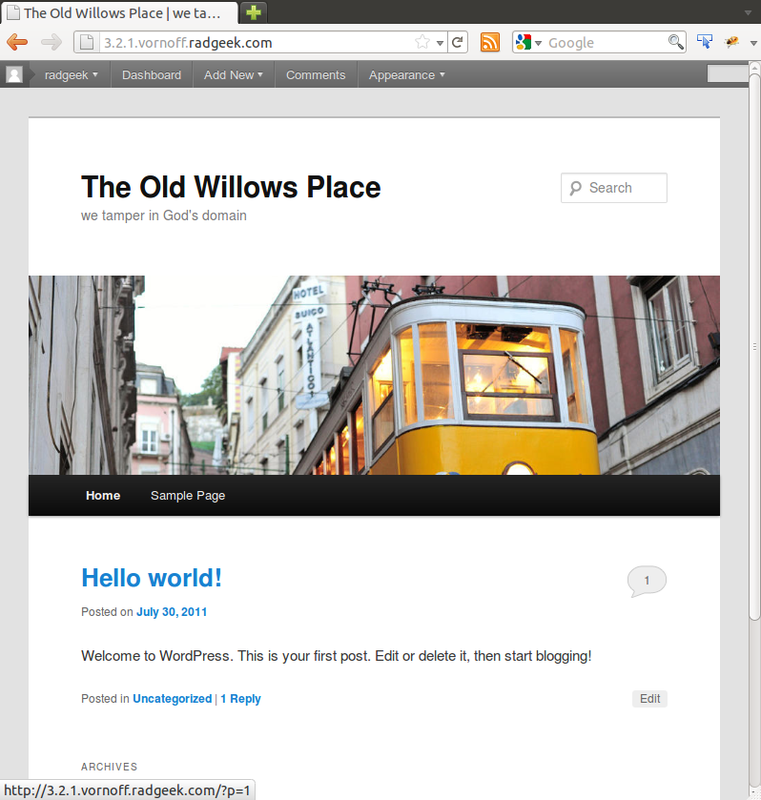 Hello Previously i was using older version of Feedwordpress there it was working perfectly with any problem. 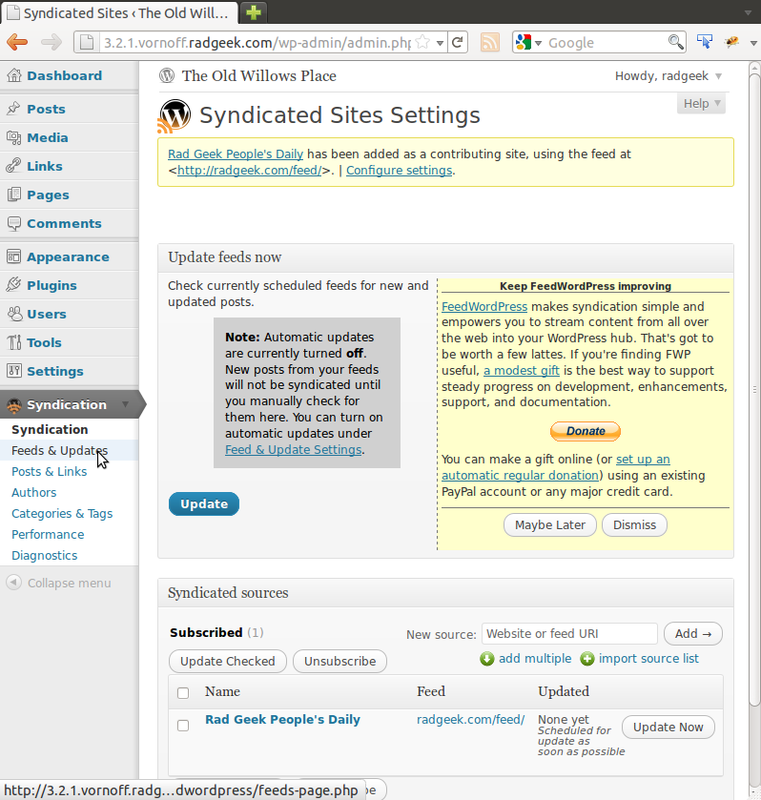 When i upgraded wordpress and feedwordpress to newer version it stops automatically check for updates now. I need to manually updated my feeds which is consuming lot of time. Please help me out on this issue. When I activate the plugin, breaks the footer and the header: http://happysingle.mrbeebe.es/category/noticias/. What’s the problem? Thank you. hi i have many rss and i would like to display each one of this rss into a page on my web site how can i do that.? i try many feeds, i do know what to do . I was running into this same problem. It occurs when another plugin updates a link using the wp_update_link() function. FeedWordPress stores a lot of data in the link_notes field, and it includes some essential newlines (“\n”) as delimiters. If you pass that data through wp_update_link(), the slashes in the newlines are stripped out, breaking FeedWordPress’s data. In my case, I’m in control of the plugin calling wp_update_link(), so the solution is to escape that field first. Very nice plugin. 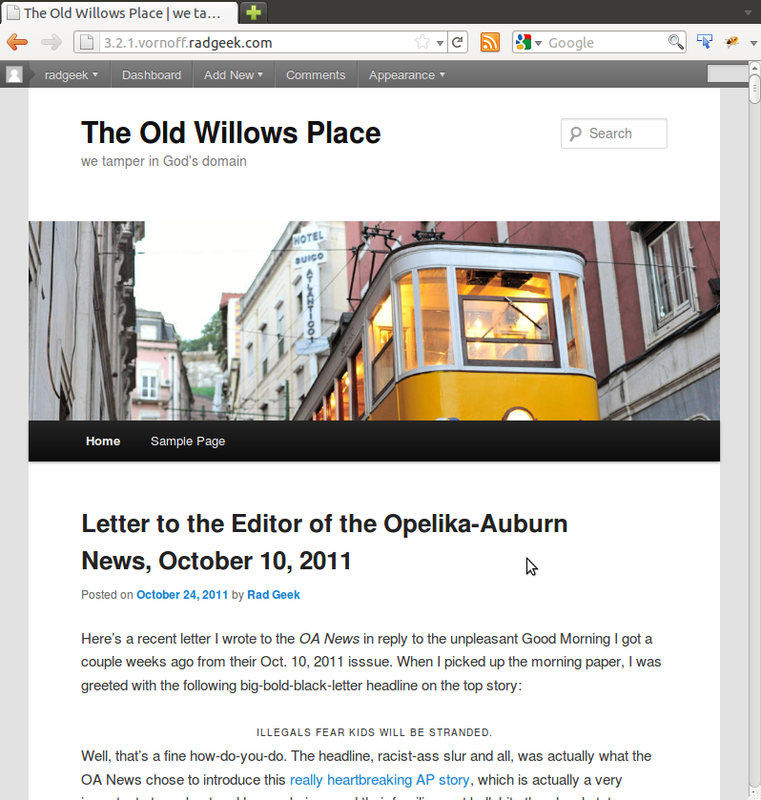 I’ve just started using it on my blog and so far it’s great. One thing though, why does it grab ALL the content of the articles it syndicates, rather than just the excerpt? 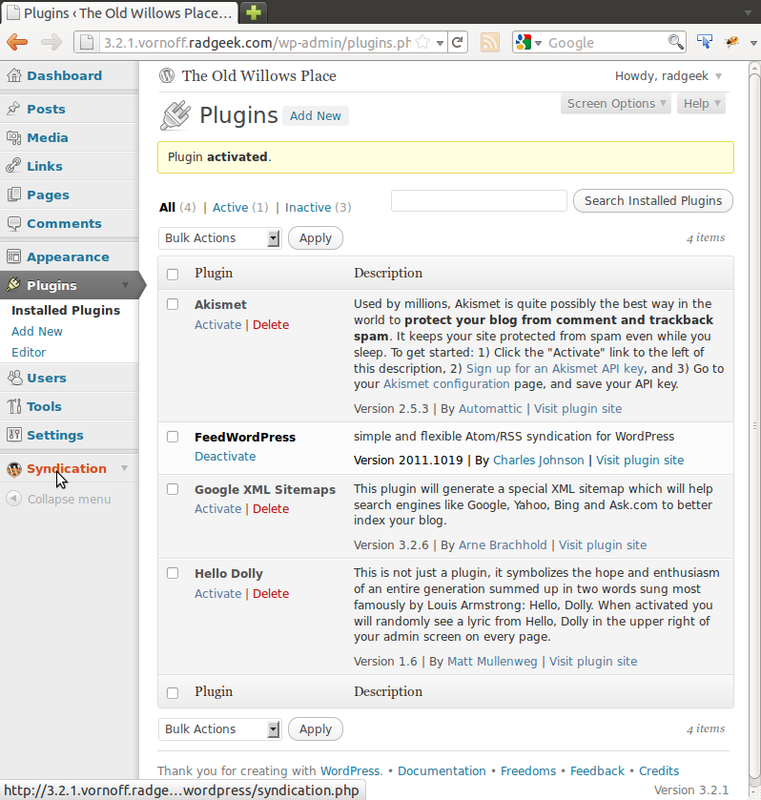 I am glad that such a plugin was made available before many others came on the scene. This plugin is still effective and I really wish that the creator would continue to work on this plugin’s improvements with new updates to benefit the users. You can continue with the free version but start a Pro version with more features and you can count me as one of your first customer. Keep up the good work and look forward to the good news! Can anyone tell me if this plugin works with AP WebFeeds (a protected pay feed service)? I’m new to WordPress sites and to FeedWordPress. I have successfully installed the plugin though and have it feeding a Tour Dates calendar from my band’s Reverbnation page to our site…however, the dates are in reverse order. So I’m looking for the parameter that I need to alter to get dates in the correct order. Any help is greatly appreciated. I am trying to get the blog content and images from the website above to merge into my new blog…images arent appearing…is it because I do not have the new site hosted on my current bluhost site where the images are? How do i change Related Articles link to my site? Magic! Thanks a lot it works, like a charm for Version 3.9.1 ! Charles, you are such a boss. I freaking worship guys like you. Looking forward to working with you in the future.